Not only Old Town Nice itself but also its immediate surroundings are interesting and beautiful. The broad Promenade des Anglais along the seafront of the Baie des Anges goes all the way to Nice Airport. At the South-East is a splendid park on the slopes and the top of the Castle Hill. And to the North-West you arrive at Place Masséna, the entrance point to a modern shopping area. Walking from Cours Saleya to the North-West over Rue Saint-Francois you arrive at the famous Promenade des Anglais. This broad Promenade along the seafront of the Baie des Anges is often chosen for walking, jogging, skateboarding and other fun activities. 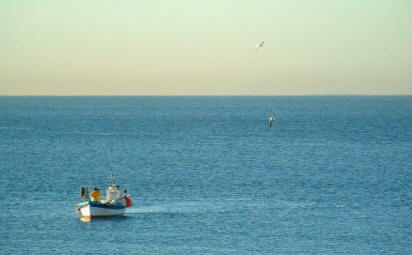 It is 7 km long and goes all the way from Old Town to Nice Airport. At the South-East of Vieux Nice is a splendid park on the slopes and the top of the Castle Hill. The name refers to the castle which was here once. On top of the mountain is a nice square with balustrades, the Terrasse Frédéric Nietzsche. From here one has a magnificent view over Nice. The first medieval town of Nice was founded on this Hill. Only some ruins are left from this early town. 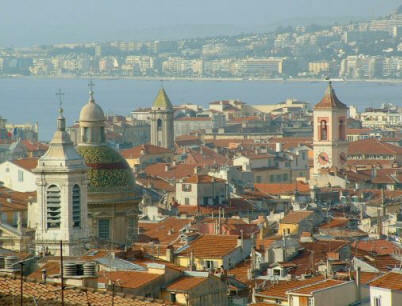 Nice was rebuilt at the foot of the hill and stayed rather small for several centuries. In the 19th century new districts of the town arose, and now Nice is the fifth largest city of France. From Old Town Nice to the North-West, walking through a nice park, you arrive at Place Masséna, the entrance point to a modern shopping area with lots of shops, big stores, art galleries, hotels, restaurants and cafés. Vieux Nice is an excellent area for a short visit as well as for a longer stay. 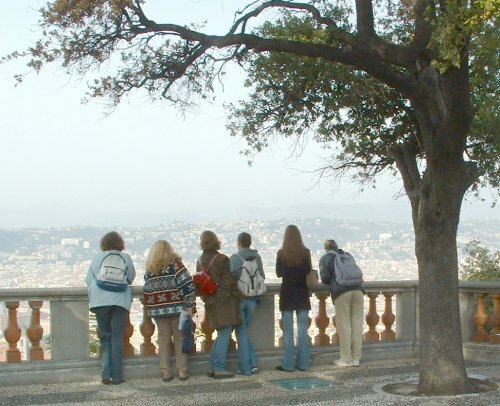 It is also a very suitable starting point for discovering the greater Nice city and the whole Côte d'Azur.